This is no sports car, but we don't expect it to be. It's a big honkin' pickup truck meant for off-roading. The surprising part is how good this thing is to drive in everyday conditions, on the way to the office, running errands, etc. Ride Quality: The suspension setup is compliant enough over imprefections, but there's a fair amount of bouncing going on because of its off-road leanings .The body-on-frame setup means that there's a built-in firmness that no amount of suspension travel can make up for. That being said, it's pretty damned good for an off-roader. Way better to drive than Jeep Wrangler Unlimited, that's for sure. Acceleration: 0-60 in about 8-and-a-half seconds isn't groundbreaking, but consider the fact that the Power Wagon weighs about 7,300 lbs means the HEMI has to move a lot of mass. It feels pretty quick, and that counts. Braking: The brake pedal is mostly progressive with some initial numbness that's over quickly. They bring the big rig to a stop well. We especially like the optional power adjustable pedals that help the driver get just the right foot positioning. Steering: Steering has good effort despite lacking feedback. Turn in is decent. Handling: This tall, heavy beast has some obvious body roll. Just don't take it too hard into the turns. The off-road tires are actually pretty good and don't squeal under pressure. 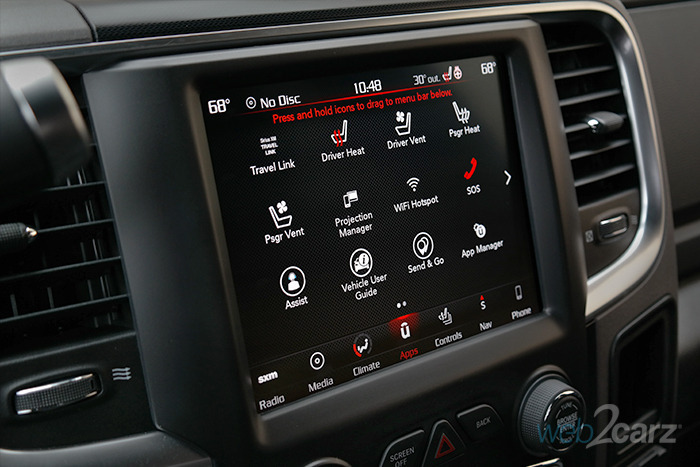 FCA does a phenomenal job with their in-car tech, and the Uconnect system is easily one of the best to look at, as well as to operate. We're not sure why more car companies can't do something this good. Infotainment System: Uconnect continues to impress us. 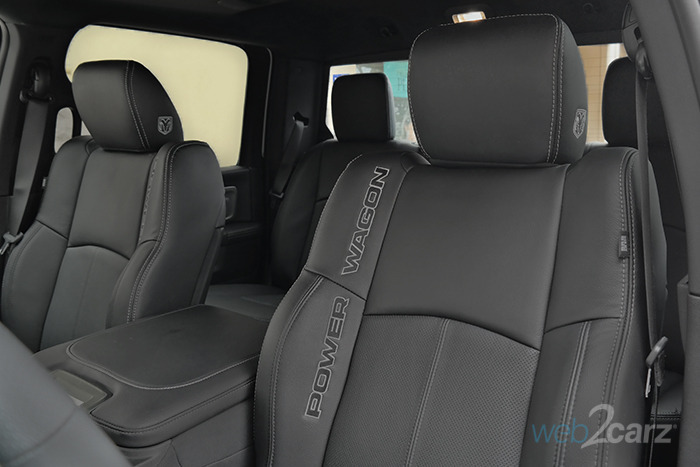 Even though the new Power Wagon doesn't get the big 12-inch screen that the 2019 next-generation Ram tucks will get as optional equipment, our tester came with the vivid 8.4-inch version that's a pleasure to use. The menus are easy, and it's one of the best systems in existence. Controls: Most of the infotainment system control are on screen, but the climate and audio still get buttons and knobs that are big and easy to access on the center stack. Great execution by Ram here. Though there's plenty of black all over the Power Wagon rather than oodles of chrome found on many of the 1500-model trucks, there's no mistaking the Power Wagon's presence. It's big, bold and brash. 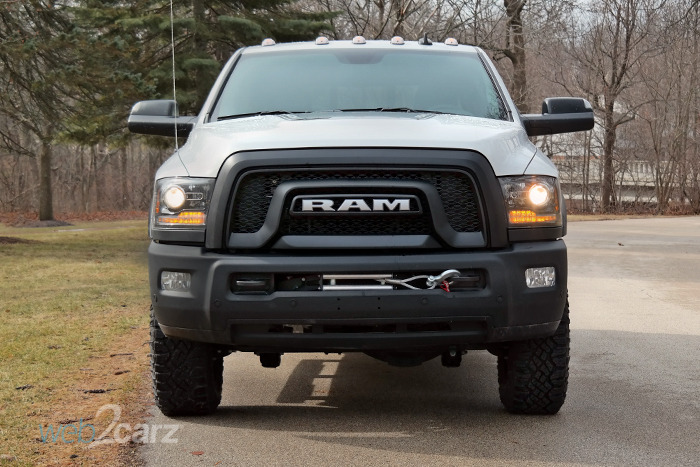 Front: The Power Wagon has strong visual ties to the smaller Ram 1500-based Rebel, and that's a good thing. The black grille and black lower fascia dominate the front end, and the nice Warn Winch gives it a real look of utility. 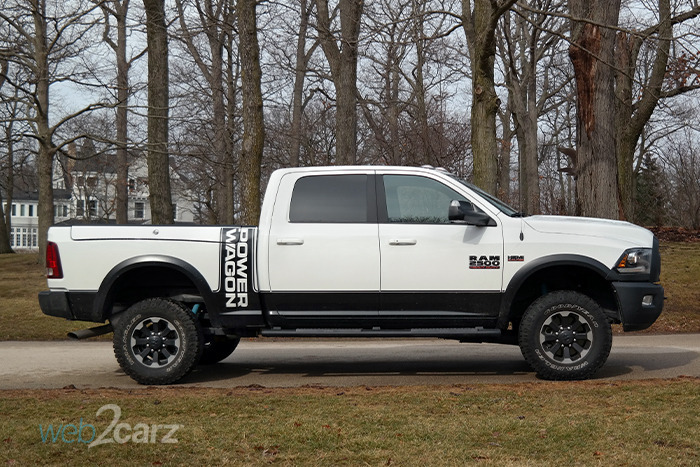 Rear: The simple back end with a mildly contoured tailgate and rectangular taillights would be understated were it not for the huge, black 'RAM Power Wagon' lettering. Profile: There's no mistaking the fact that this thing is created for dirtier duties than mall-hopping. The black trim and rugged wheels display its purpose clearly. The giant decal needs to go or get seriously downsized. Cabin: It's way better than you expect it to be. The dark coloring might be uninspiring, but everything is well laid out and looks solid. Gone are the days when off-roaders were painful to ride in. The upscale cabin and good materials make for an interior that the family can actually be comfortable in. Front Seats: Big and wide, the gray leather seats are supportive and well-cushioned. Rear Seats: The rear seats are definitely not afterthoughts. They're good for adults, and there's decent legroom, too. NVH (noise/vibration/harshness): Surprisingly, there's less road noise from the off-road tires than you'd expect. Even highway speeds don't equate to a noisy cabin. It's also well-built with no creaks or vibration. Visibility: This thing is really tall, and though you can see out clearly, the squared-off hood and height make it challenging to place easily. Climate: The climate system is very good, and the heated/ventilated seats and heated steering wheel are excellent options that work quickly and effectively. 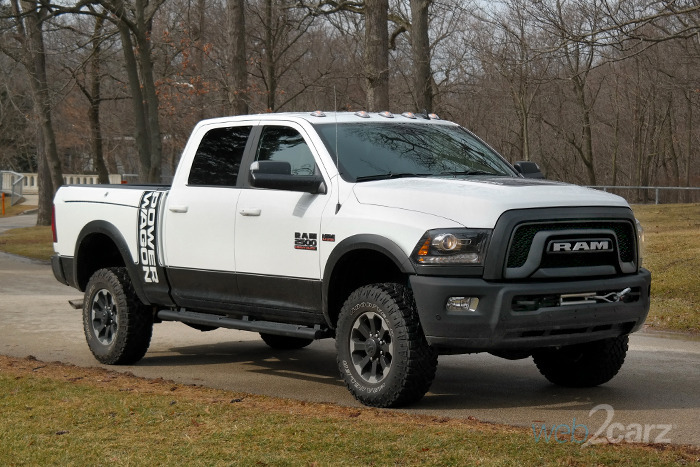 Neither the Ram Power Wagon nor the Ram 2500 on which its based have been crash tested. Standard Tech: Aside from the backup camera and tire pressure monitor, there's not much in the way of standard safety equipment. The Power Wagon is brilliant at storage. From the bed's locking side compartments to truly useful spaces in the cabin, it's ready to take on big and small cargo/storage jobs. Storage Space: The cabin is full of great storage compartments, from a capacious armrest to the brilliant fold-out flat load floor underneath the 2nd-row seats, the Power Wagon can take more on in the interior than you'd imagine. 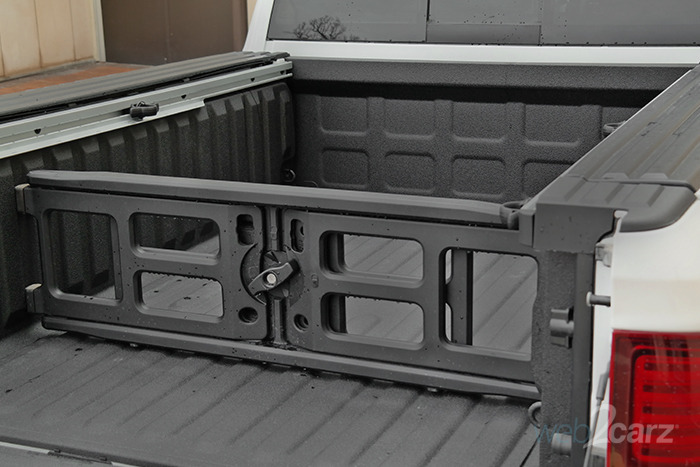 Cargo Room: The versatile bed has 76.3 inches in length and 66.4 inches in width. The adjustable bed divers help keep things in place while you're driving. A brilliant addition. There's no requirement for manufacturers to provide mpg estimates to the EPA for Heavy Duty vehicles, and the Power Wagon certainly qualifies for that category. 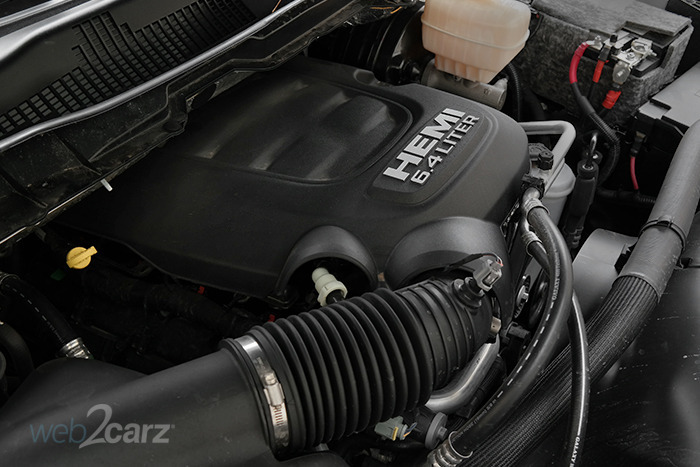 It's not a miser and suffers due to its off-road ready tires, big displacement HEMI engine, and prodigious weight, but we didn't expect a vehicle like this to be efficient at all. Driving Factors: We didn't take the Power Wagon off road but remained on paved local roads and highways during our testing. 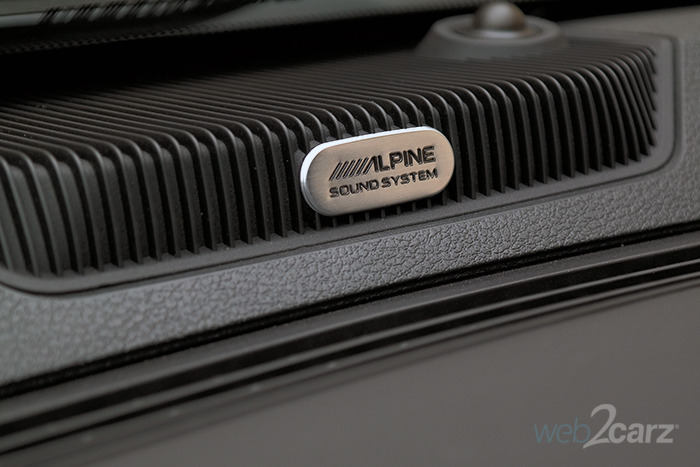 The 9 Alpine Speakers with Subwoofer is very good, but we're not sure it's worth the near $5,000 you have to spend for the Leather and Luxury Group that it's packaged with. The sound is clear and rich, but we can't compare it to the stock system, so we don't know how much better it is. Final Thoughts The Power Wagon is a purpose-built off-roader that's surprisingly easy to drive on-road, as well as impressively comfortable. Those who have no intention of using it for anything more than street driving are wasting their money. The Power Wagon's suspension articulation and approach and departure angles mean that it's really about having fun in the rough and tumble. The tech and comfort levels belie its intended purpose, but that just means it can be driven every day without worry. Of course, that also means you don't have to care about its abysmal gas mileage.